LASIK eye surgery permanently changes the focusing power of the eye by reshaping the corneal surface with the excimer laser light. So let us look at the cornea, the target part of the eye in LASIK surgery, and try to simplify its structure and function. 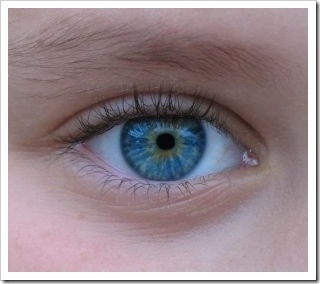 The cornea is the clear crystal part of the front surface of the eye. Like the crystal on a watch, the cornea gives us a clear window to look through. It is about 1/2 millimeter thick (550 ± 50 micrometer) and has five distinct layers. The cornea receives its nourishment in the form of oxygen, minerals and glucose from the small vessels at the outermost edge of the cornea, alongside with the aqueous humor and tear film. The cornea is richly supplied by nerve endings in the cornea, resulting in this being a very sensitive tissue, which is very painful if disturbed. The corneal epithelium is the outermost layer of cells of the cornea and composed of five to six layers of epithelial cells. It provides a smooth optical surface and barrier against infection by preventing foreign materials, bacteria, etc. from entering the cornea. Epithelial cells have the power to regenerate quickly, when the cornea is injured. 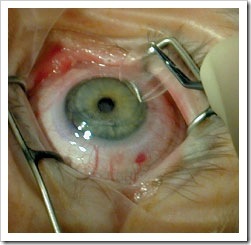 However, if the injury penetrates more deeply into the cornea, it may leave a scar. Scars leave opaque areas, causing the cornea to lose its clarity and luster. Below the epithelium is Bowman's layer, a cell-free structure composed of uniform collagen fibers. Because this layer is very tough and difficult to penetrate, it protects the cornea from injury. This layer is incapable of regeneration when the cornea is injured. The bulk of the corneal substance is called the stroma, which is made up of uniform and regularly spaced collagen fibers arranged in bundles glued together with a complex material called ground substance and interspersed with a few cells. In LASIK eye Surgery, the excimer laser will removes some tissue from this section of the cornea, so that the cornea is reshaped. Beneath the stroma is Descemet's membrane, a cell-free, strong, elastic membrane that is the basement membrane of the corneal endothelium. It grows throughout life and becomes slightly thicker with advanced age. The endothelium is a single layer of cells that removes fluid from the cornea. With aging, inflammation, trauma, the endothelial cell count diminishes. As the endothelial cells die out and disappear, the adjacent endothelial cells thin and spread out to take their place, diminishing the endothelial cell count. Why is the cornea clear? In addition to protecting the delicate structures inside the eye, the cornea helps focus rays of light on the retina to create an image. Its working is similar to that of the lens of a camera, focusing rays of light to create an image on the film.